The original Enterprise’s voyages to explore strange new worlds, and to seek out new life and new civilisations under the auspices of its most famous captain, are a legend Star Trek fans are more than familiar with. But Kirk wasn’t the Enterprise’s first captain. Now that the famous ship has shown up on Discovery, here’s a brief guide to what we do know about what came before. Honestly – and oddly, given its stature as one of the most legendary starships in Federation history – there’s not a whole lot known. 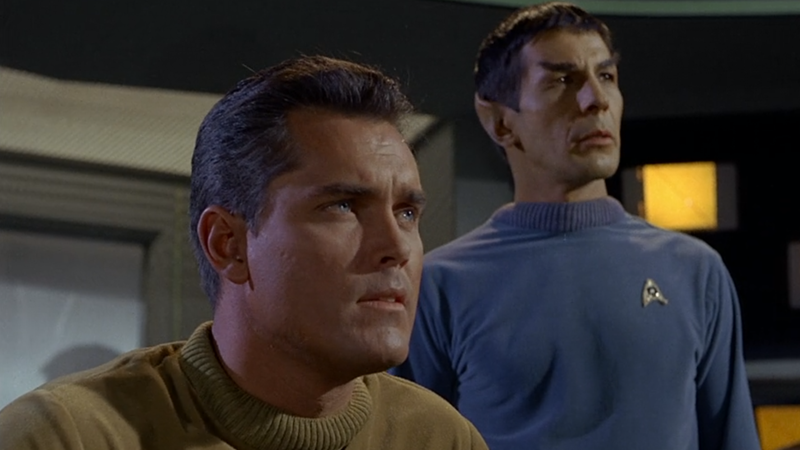 Two captains took command of the Enterprise before Kirk’s five-year mission in 2265: Robert April and Christopher Pike. And even then, what we know of their time aboard the ship is limited to just a handful of Trek episodes – and now, in the case of Pike specifically, the occasional titbit dropped here and there now that he’s currently helping captain the Discovery. But even with just a few nuggets of information to go on, we can still paint a clearer picture of the 20 years the Enterprise spent boldly going before Kirk got his hands on it. The Enterprise was one of the first 12 Constitution-class starships commissioned by Starfleet in the mid 23rd century. The Constitution-class would become the pride of the Federation fleet, self-sufficient heavy cruisers that were capable of operating farther away from Federation Starbases for longer, and designed for extended years of solo exploratory and diplomatic missions out in the galaxy – the vanguard of the Federation’s exploration of the stars beyond its current borders. 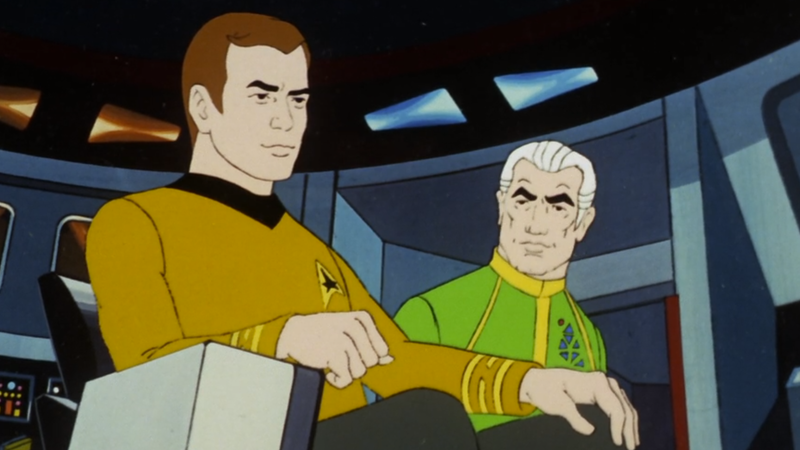 Captain April, the first to command the Enterprise, has only ever appeared once on screen – in the final episode of Star Trek: The Animated Series, 'The Counter-Clock Incident', set just ahead of his planned (albeit undesired) retirement from Federation service. April actually helped oversee the Enterprise’s construction at the San Francisco Naval Yards; he was directly involved in not just trial runs for the vessel and its fellow Constitution-class ships, but overseeing technical components. His wife Sarah designed tools for the ship’s sickbay, and eventually served as the Enterprise’s first Chief Medical Officer. 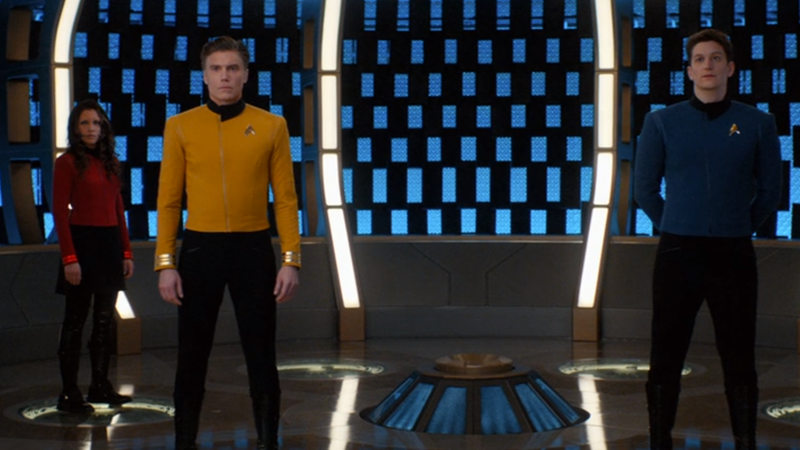 Rounding out what little we know of April’s command staff was none other than Christopher Pike himself, who would serve as First Officer on the ship he’d one day command. April’s command of the Enterprise lasted for just one five-year exploratory mission between 2245 and 2250, and... that’s pretty much all we really know about it. The Star Trek: Discovery tie-in novel Drastic Measures notes that the Enterprise, under his command, was present in offering relief efforts after the infamous massacre on Tarsus IV. It was a traumatic experience that is part of Kirk’s own backstory, and covered in the original series episode 'The Conscience of the King', having been a child that survived the nightmarish execution of half of the planet’s colonists after a major food shortage. But beyond that, details of April’s other exploits in those five years have never officially been covered. What we do know is all retrospective. 'The Counter-Clock Incident' told us that after the conclusion of the mission April was promoted to Commodore, and shortly thereafter left the Enterprise to become the Federation’s ambassador at large, one of its most noted diplomats (presumably thanks to the number of contacts he developed exploring unknown areas of the galaxy). Brief references in Discovery paint him by the mid-2250s as one of the most notably decorated Captains in Starfleet history up to that point... a list that also included April’s replacement aboard Enterprise, First Officer Pike. Pike’s tenure aboard the Enterprise lasted for much longer (maybe Starfleet decided that just promoting and replacing captains every five years was a bad idea?). But, while we do know a little more about Pike’s time aboard the vessel, like April’s career it’s still mostly vague. We know that at least part of the command crew changed – Doctor April left the ship with now-Commodore April, replaced by Phillip Boyce as Chief Medical Officer. A new Number One (played by Majel Barrett in 'The Cage' and Rebecca Romijn in the second season of Discovery) stepped in to take Pike’s position, and around 2254 the ship gained a new Science Officer in Spock, who would work with Pike in the position for the remainder of Pike’s command – and of course continue on with Pike’s replacement, James T. Kirk. Long term mission of space exploration was once again priority for the Enterprise at this point, but it’s in the 2250s that we really start to see the Enterprise and its fellow Constitution-classes begin to earn a legendary reputation. As Starfleet’s pride and joy, the Enterprise, and its sister ships, were considered the cream of the crop when it came to assignments, with access to not just the latest tech the Federation had to offer, but even early access to upcoming Starfleet uniform changes, like the move from blue and metallic-accented jumpsuits to the classic, brightly colored uniforms we see in the original Star Trek. At least in comparison to April’s command, we got to see some of Pike’s adventures on his missions in of Star Trek’s earliest episodes – specifically its failed pilot 'The Cage' (which had footage reused for 'The Menagerie', parts one and two, in Trek’s first season, a story that is mostly set more than a decade after Pike’s early command). So we mostly know that Pike visited places like Rigel VII and Talos and was – despite the fact he would continue to command the Enterprise for almost another 10 years after the fact – contemplating retirement from command after losing several crew members on an away mission. By the end of his encounter with the Talosians, however, Pike was re-invigorated by his mission to explore the stars. Which is pretty good because just two years after the events of 'The Cage', all-out war between the Federation and the Klingons broke out following Star Trek: Discovery’s Battle at the Binary Stars. Pike and the crew of the Enterprise, already midway through another multi-year mission, were eager to return and take part in the war, but were specifically kept from returning by the Federation, as a potential last resort should command fall to the Klingon threat (plus, interesting sidenote: an upcoming Discovery novel will explore at least a little of what the Enterprise was up to during the war – mainly being caught up in another war, it seems!). That didn’t happen of course, thanks to a bit of near-genocide and a certain alt-reality evil emperor as well as the crew of the Discovery, which meant that the Enterprise got to carry on boldly going to its heart’s content. Well, until we get to where Discovery’s second season is right now – the Enterprise is recalled to investigate a series of mysterious signals appearing all over the galaxy, only to find its systems heavily damaged en route, crippling the ship. Pike jumps over to the Discovery to command the mission from there, and the poor Enterprise is dragged back home for repairs... where it’s likely going to stay until the end of Discovery’s second season. Beyond that, we don’t really know what Pike was up to after the case of the red signals ongoing in Discovery. We know that he returns to command the Enterprise on at least one more long-term exploration mission after its extensive repairs, after which he was promoted to Fleet Captain and retired from the Enterprise’s captaincy, handing command over to Kirk ahead of another fateful five-year mission for the now truly-iconic Enterprise. Given that the Enterprise is the most important vessel in Star Trek, it’s kind of weird how little we really know about its earliest years before Kirk captained the ship right into the history books. Over time, in titbits here and there, we’ve learned enough to piece together a rough history like the one above – and thanks to Pike’s arrival on Discovery, we could be close to getting at least a few more snippets to flesh out this hazy two-decade period. But it seems that, for now at least, the early days of Starfleet’s finest ship are going to remain confined to a history we’re never quite going to truly learn about. You know, unless CBS All Access greenlights yet another Star Trek show.